Do you see any class listed below that you think you or your child will enjoy? Come take a FREE TRIAL CLASS with us! 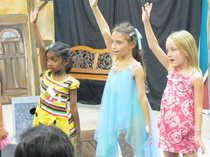 We offer singing, dancing, and acting classes Monday - Saturday each week. ﻿These classes are for the student who wants to improve all of their Musical Theatre Performance Skills. This class will include instruction in acting, dance, vocal performance, music theory, voice and diction for the stage, and stage combat. It will also offer basic instruction in technical theatre such as costume, set, and lighting design, and will introduce American musical theatre history, play analysis, and play writing. This is for the more serious student who wants to experience all aspects of Musical Theatre. ﻿These classes will investigate basic to intermediate acting skills. Topics covered include voice and diction for the stage, monologue work, duet acting skills, script analysis, character development and back story, improvisation, and beginning stage combat. Each class will be at the age and skill level of the students, but will work to stretch each of them beyond their abilities to help them grow as young artists. These classes are for students that want to experience or improve their public speaking, presentation, and acting skills. Classes for our High School and above students are designed to further develop young artists as they fine tune their skills and prepare for further education at the college level. Additionally their classes will include play analysis, “How to Audition”, and scene study. Many of these students may be new to these skills, and others may have worked on them for some time. Expectations will be on an individual basis, but all will learn from each other. We become better actors when we become better observers. When you are aware of your world you will grow as an artist. These classes will investigate different styles of dance including Ballet, Tap, Jazz, Hip Hop, Lyrical, Tumbling, and Partnering Skills. Each class will begin with a full body warm-up, across the floor, and combinations unique to each dance form we are studying. The students will gain an appreciation for the many different styles of dance necessary for Musical Theatre. These classes are for students wanting to learn to sing in a group environment. We will work on ear training, breathing skills, tone, and using the voice both as a solo and ensemble instrument. Tuition - No Tuition - Receive training in exchange for assistance in design, construction, and repair of costumes for current production. Will also receive community service hours if needed. 7. Only one voucher, discount, or deal can be utilized at one time.